Often, job applicants will turn in a brilliant resume, an outstanding cover letter and credible references, and still won't get hired for the job because they were unprepared for the interview. Whether it's arriving late, not knowing how to speak about their work experience, or not knowing enough about the company, job seekers who do not make a good first impression at the interview lessen their chances of getting hired. The key to a successful interview is showing up prepared and confident. In order to accomplish this, here are a few steps to complete before coming to the interview. First, research the company's mission statement. The goal for the interview is to prove to the company that you can do the job and will fit right into the company. Memorize key parts of the mission statement and prepare to tell the company how you fit. It’s also helpful to research common salaries for your job field and location. This will help you prepare for salary questions, if asked. You will also want to research the company and think about what questions you want to ask the hiring manager. The questions that you ask during and at the end of an interview will show how interested you really are in the position. For example, “I read that the company will be implementing new sales initiatives. How do you feel this change will affect the company moving forward?” Make a list of possible questions you would like to ask at the end of the interview. If possible, research the person who will be interviewing you to give you some potential talking points. The more prepared you about the job, company, and your own work experience, the more confident and competent you will appear during your interview. Research sample interview questions and prepare answers for them. Ask a friend or family member you can trust to be critical and honest to do a mock interview with you. Prepare a few stories about yourself that showcase your positive traits in case you need them during the interview. Reread your resume and cover letter before you go into the interview. Many interviewers will ask you questions about something you included on your resume, and you do not want to be thrown off or unprepared to discuss it. You don't want to choose an outfit the morning of your interview and discover that there is an issue with the clothing or the way you feel wearing it. Choose a couple outfits you may wear to the interview at least a few days prior. Wear the outfit during the mock interview to ensure that you are comfortable and confident in it. Make sure that the outfit fits the culture of the company atmosphere and appears professional and suiting to your personal style. Be sure to lay the outfit out the night before the interview - clean, ironed and ready to go. Your portfolio will look different depending on the job to which you are applying. Make sure that you have at least two copies of the resume in your portfolio: one for you and one for the hiring manager. Also include your letters of recommendation and references, a pad and pen to take notes during your interview, a business card, and any professional documents you would like to include, such as samples of your work. It's always a good idea to arrive 15 minutes early to the interview. To ensure you get there on time, take a test drive to the interview location around the same time your interview will be. This will give you an idea of where you are going, what the traffic should be like, and what the parking situation is before your interview day. Brainstorm some strategies for dealing with stress. 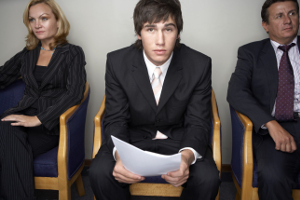 The added 15 minutes you gave yourself should allow for time to collect your nerves before the interview. Keep your body language in-check. Always smile and appear as warm as possible. Preparing for the interview ahead of time will take away most of the distractions, and make you feel more at ease. Coming to the interview on-time, prepared and secure shows respect, and this respect tells the hiring manager that you will perform the job to your best abilities.